1. 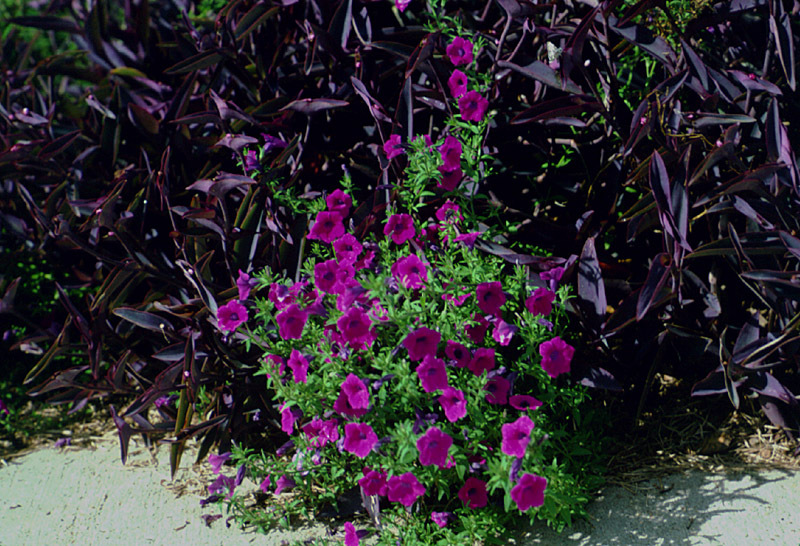 'LAURA BUSH' PETUNIA: A reseeding annual old-fashioned petunia. More cold tolerant, disease resistant and heat tolerant than modern hybrids. Spreading growth habit with deep lavender, medium size flowers. Space transplants 12 inches apart. Prefers full sun in well-drained, fertile soils. This V.I.P. petunia is native to South America. The flower is violet colored and the plant is heat tolerant and low spreading. The plant is known for its profusion of small bell-shaped violet colored flowers. Both dainty and durable, it's one of the parents of all modern petunias. It is a great plant for beds, baskets or barrels. Her offspring, the 'Laura Bush' Petunia, offers just as many colorful blooms but the blooms are twice as large and the plant has larger, darker green foliage which serves as a background to showcase the spectacular floral display. People always want characteristics in plants which are uncharacteristic of that plant type. For instance, we want citrus trees which produce good tasting fruit and tolerate sub -20 degree F. temperatures; we want tomatoes which will store for months after harvesting produced on cold tolerant plants; we want flowers to grow in stone and bloom all year; we want petunias to tolerate the hot temperatures of summer and have a multitude of blooms. Why can't these characteristics be incorporated into the plant of our choice? For such wondrous characteristics to be utilized in a plant variety, the desired traits must be genetically inherent in some plant line(s) of that particular species so that, via plant breeding, these traits can be transferred to the ultimate, hybridized super-plant. Many times we want too much, i.e., you can't make a silk purse out of a sow's ear. 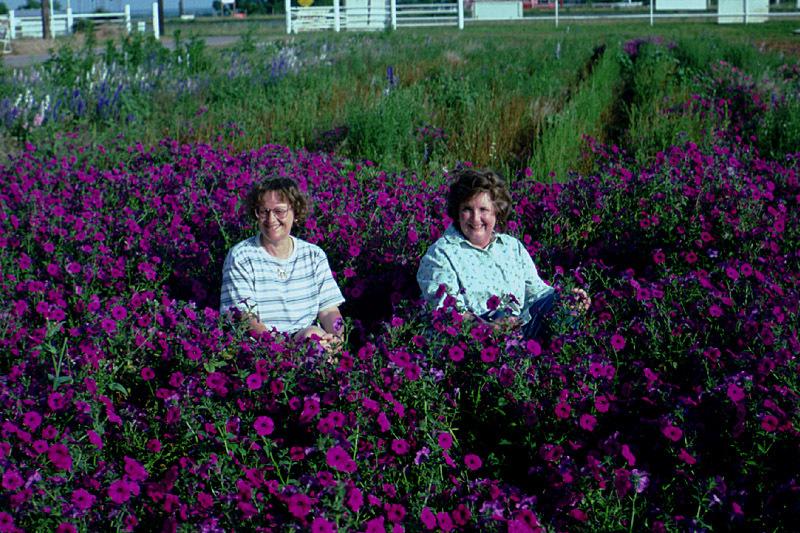 But in the case of petunias, especially in the case of creating a petunia which tolerates the hot summer temperatures and has a multitude of blooms, the Mother of all petunias which fulfills the heat and bloom requirements has been brought from Germany by Greg Grant, former Extension horticulturist and former Director of product development for Color Spot Growers. This tough little petunia beauty was observed at a horticulture exposition in Stuttgart, Germany in July, 1993, and is now available in local nurseries under the name V.I.P. petunia. V.I.P. is the acronym for Very Important Plant (Petunia) or Violet In Profusion since the Mother of all petunias should be considered a very important plant. This is not the old-fashioned, reseeding annual Petunia X hybrida which many local gardeners enjoy every year. 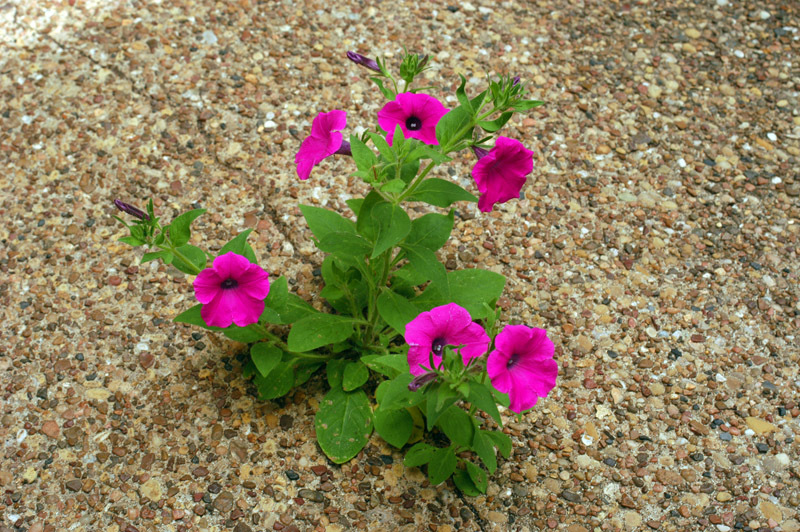 This is its Mother (Petunia violacea). 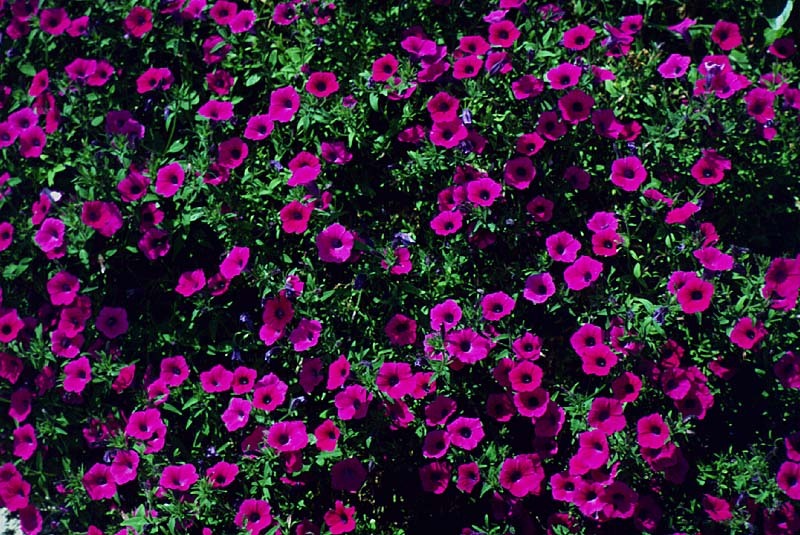 Petunias are NORMALLY extremely "thermophotoperiodic." That is, their growth habit responds according to the temperature and the amount of daylight. At 62 degrees F. to 75 degrees F. , the growth habit will vary depending on daylength. At temperatures above 75 degrees F., whether under short (less than 12 hours) or long (more than 12 hours) days, the plant will USUALLY be tall and leggy with a single flower. This is how hot weather takes its toll on petunias. I emphasize the terms NORMALLY and USUALLY because the V.I.P. petunia defies the law of thermophotoperiodics since it is a trailing type, perfect for hanging baskets. To add icing to the cake, so to speak, the V.I.P. 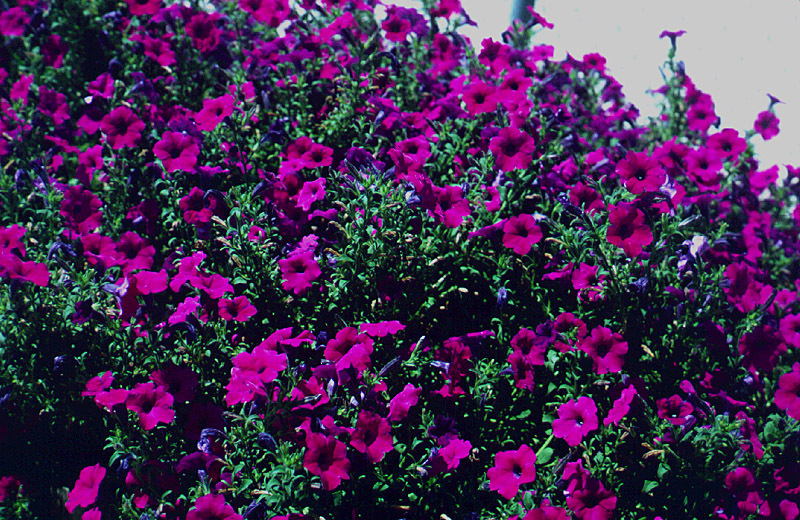 petunia is practically sterile which stimulates continuous bloom. This super V.I.P. 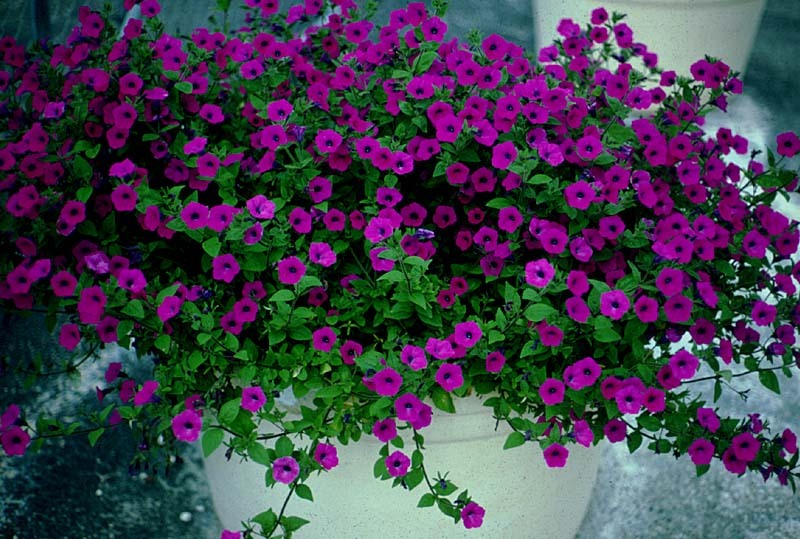 petunia is only available in one color -- violet. The violet color, composed of purple and red pigments, practically glows. According to color expert Ken Charbonnau, Director of Color Marketing at Benjamin Moore Paint Company, the big news in color are purple and blue-violet. In the backyard garden or for patio containers, you may want to create a more relaxing and serene mood by choosing cooler or softer colors which V.I.P. petunia provides. There are basically five types of petunias: the double grandiflora, double multiflora, single grandiflora which includes the large flowering cascades, single multiflora, and California giants. The size of the flowers vary anywhere from the smallest of one inch in diameter to five to six inches. In the case of petunias, big IS NOT best! The big blooms of the grandiflora petunias are showy and look nice in catalogs but they are not durable or practical. The lightest rain or watering will droop and discolor the large grandiflora blooms. Since the bloom is the focal point of a flower bed, the gardener wants as many beautiful blooms as possible. 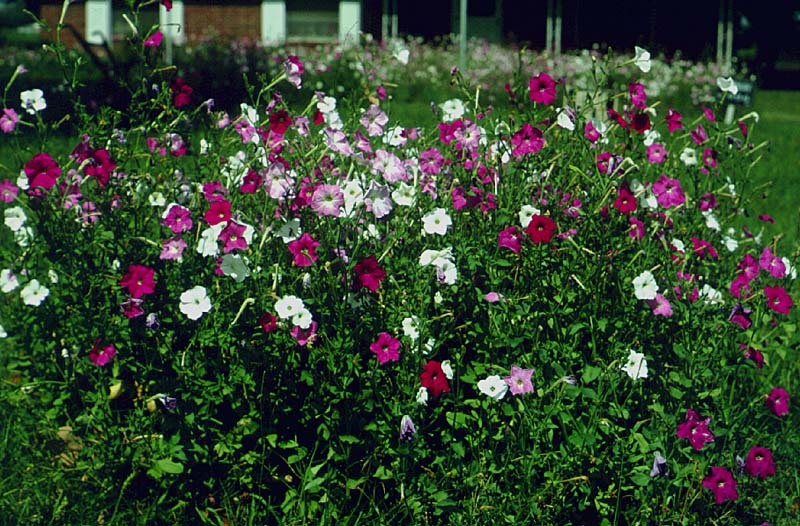 Multiflora petunias such as the carpet series have been the champs -- small, but durable and prolific. 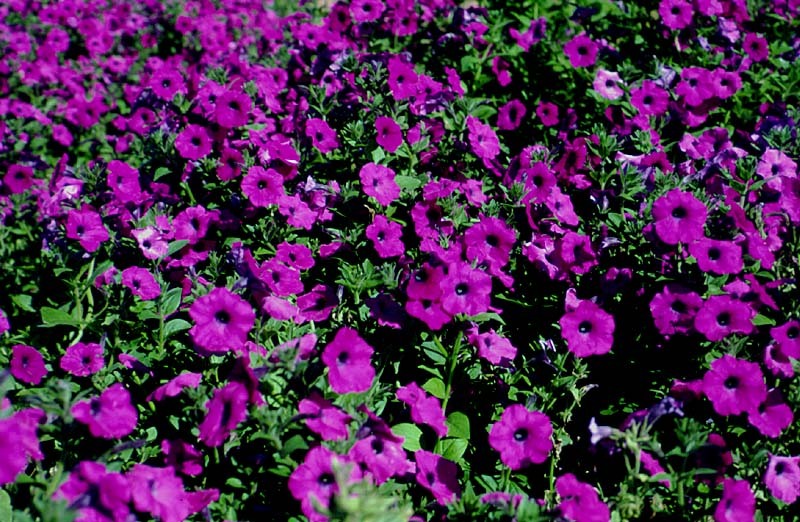 Multiflora petunias have medium-sized blooms and lots of them. Multiflora types are more disease tolerant and withstand South Central Texas winters better than other bloom type mentioned. The V.I.P. petunia is a new class called "Milliflora" because they are dramatically smaller than any other petunia on the market. The 1 - 1.5 - inch flowers are about one-third the size of standard Multiflora petunias but what they lack in size they more than make up in number and duration. Petunias should be planted in full sunlight, if possible, since even the V.I.P. will become spindly and have fewer flowers if grown in the shade. This is not to say that petunias will not tolerate moderate or light shade, but they need a minimum of seven hours of direct sun. The V.I.P. petunia has a trailing habit which can be enhanced by periodic trimming during the growing season.I have mentioned that the V.I.P. petunia is tough but I have not indicated just how TEXAS TOUGH this petunia type really is. Normally petunias planted any later than April in this area NEVER have a chance to bloom before the extreme summer temperatures annihilate plants. With the advent of the V.I.P. and the 'Laura Bush' petunia, Texans can FINALLY have a profusion of petunias all summer long and even planted with such Texas - tough plants such as lantana and Purple Heart. It is generally not necessary to apply any fertilizer before planting. However, one week after the plants have been planted, begin applying fertilizer. Use a slow release fertilizer with an analysis such as 19-5-9 at the rate of 2-3 pounds per 00 square feet of bed area. Be sure to water the fertilizer into the soil and remove any that may have fallen on the foliage of the plants. Apply fertilizer monthly throughout the growing season. Water soluble fertilizer high in analysis such as 20-20-20 may also be used with the first application being made the day the petunias are planted. Apply the water soluble fertilizer as instructed on the container. Petunias have another decided advantage over many other plants in that they have relatively no serious insect or disease pest. Aphids may become a problem, but these can be controlled by spraying or dusting the plants with Malathion or diazinon. Slugs also seem to like to feed on petunias and these can be controlled by the use of baits. A good preventive measure for fungus diseases is to avoid watering plants from above and wetting the foliage. 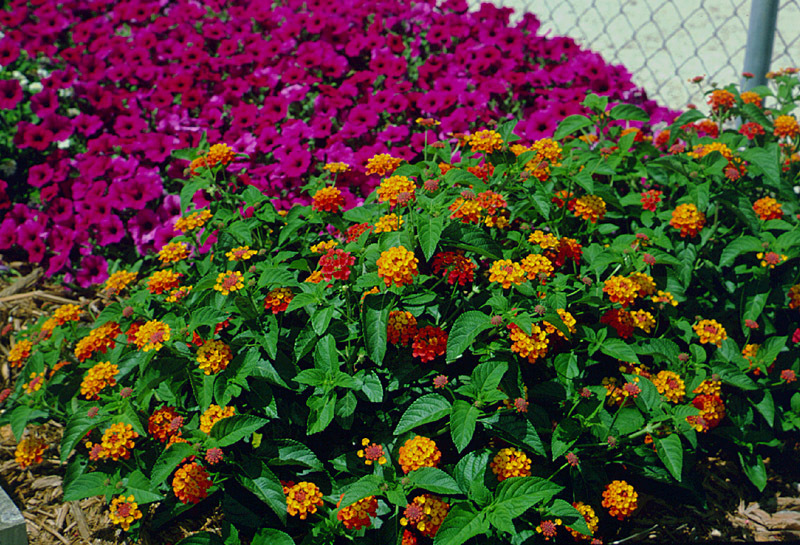 This can be accomplished by the installation of drip irrigation tubing in the flower bed before planting. If the plants become contaminated with a fungus disease, pick off the infected leaves or flowers and spray remaining leaves, weekly with a fungicide such as benomyl (Systemic Fungicide), bayleton (FungAway) or Ortho Funginex. It is also important to remember that petunias don't like water on their flowers. Note that, after a rain, petunias close up and appear to be wilted. So, when you water, use a watering wand or drip irrigation system so plants are watered well at ground level. Once water has touched the flower, it will take several days before it is fully open again. This is especially true of the grandiflora bloom types but, as we would expect from the new SUPER-V.I.P. and JUNIOR petunia, the blooms recover more rapidly after rains. Now, the good news is that V.I.P. has produced an offspring, the 'Laura Bush' Petunia, which is just like its mama but even better in some very important ways.